Democrat Bill Ritter was the Governor of Colorado from 2007 to 2011. Colorado has elected 17 Democrats and 12 Republicans to the governorship in the last 100 years. Incumbent Governor John Hickenlooper, who was elected in 2010, is a Democrat, and his predecessor, Governor Bill Ritter, who won election in 2006 is also a Democrat, though his predecessor Bill Owens is a Republican. The state's electoral votes went to Democrat 2000 and 2004, and Democrat Barack Obama in 2008 and 2012. The people of the state of Colorado are additionally represented in the (D). Until the election of Barack Obama, the people of Colorado had voted Republican in every U.S. Presidential Election since 1964, with the exception of 1992 when a plurality voted for Bill Clinton, (possibly due to the effect of Ross Perot's candidacy.) Conversely, Colorado has held a Democratic governor for 22 of the past 30 years. Colorado has a history of voter initiatives which severely restrict the power of state government. Some of these initiatives include Term Limits on legislators (1990), Taxpayer Bill of Rights (TABOR) (1992), and Amendment 23, passed in 2000, which set a fixed percentage of the budget for K-12 education. Voters passed Referendum C in 2005, amending some restrictions of TABOR and Amendment 23. Colorado supported Ken Salazar won a U.S. Senate seat and his brother John Salazar won a seat in the U.S. House, while the Democrats captured both chambers of the state legislature. Most recently, in 2006, Democrat Bill Ritter won the governorship by a 16-point margin while the Democrats expanded their majorities in both chambers of the state legislature and Democrat Ed Perlmutter captured another U.S. House seat. In 2010, however, Republicans made big gains in the state. They won the statewide races of Attorney General, Secretary of State and Treasurer. Republicans also defeated two incumbent Democratic House members to hold a 4-3 majority in the state's House delegation. Furthermore, Republicans took control of the Colorado House of Representatives. This occurred even as Democrat John Hickenlooper won the governorship, albeit over weak and divided opposition, and Democratic Senator Michael Bennet was re-elected. Also as a result of the 2010 gubernatorial election the Constitution Party gained major party status as it passed the 10% popular vote threshold, putting it in an equal legal position with the Democratic and Republican parties in terms of rights under state election law. However, the Democrats regained the Colorado House by a large margin during the 2012 election. Colorado was a battleground state in the 2008 U.S. Presidential Election between Senator John McCain and Senator Barack Obama. Obama won Colorado, by a margin of 8%, with 53% of the vote to McCain's 45%. Currently, the Assembly is split with Democrats controlling the House and Republicans controlling the Senate. The 64th Colorado General Assembly was the first to be controlled by the Democrats in forty years, as the Republican Party traditionally held control of the state government. Colorado now being a swing state has seen increased competitiveness and consequently, variation in partisan control of the statehouse from election to election. The current Speaker of the Colorado House of Representatives is Dickey Lee Hullinghorst. The Colorado Senate is the upper house of the Morgan Carroll. 18 seats are up for election in 2016. The Colorado House of Representatives is the lower house of the Colorado General Assembly, composed of 65 seats of approximately 77,000 people each. Representatives are constitutionally limited to four consecutive two-year terms. The House is currently composed of 34 Democrats and 31 Republicans, and is led by Speaker of the House Dickey Lee Hullinghorst, Majority Leader Crisanta Duran, and Minority Leader Brian DelGrosso. Every seat is up for election in 2016. Republican Cory Gardner and Democrat Michael Bennet are Colorado's junior and senior United States senators, respectively. Bennet was appointed by Governor Bill Ritter in January 2009 to succeed Ken Salazar, who resigned following his confirmation by the Senate as United States Secretary of the Interior in the Barack Obama administration. Michael Bennet won his first full term to the United States Senate in 2010. Cory Gardner represented Colorado's 4th congressional district in the House of Representatives since 2011 before ousting incumbent Senator Mark Udall in 2014. Colorado has had seven seats in the United States House of Representatives since the 2000 reapportionment. Colorado's 1st congressional district is represented by Democrat Diana DeGette of east Denver. The district runs southwest to northeast, containing Columbine in Jefferson County, Englewood and Cherry Hills in Arapahoe County, and all of Denver County. Diana DeGette has yet to raise any significant challenger in the 2016 congressional election. Colorado's 2nd congressional district is represented by Democrat Jared Polis of Boulder. The district contains all of Larimer, Grand, Summit, Clear Creek, Gilpin and Broomfield counties, most of Boulder County, and parts of Jefferson, Eagle, and Park counties. Jared Polis has yet to raise any significant challenger in the 2016 congressional election. Colorado's 3rd congressional district is represented by Republican Scott Tipton of Cortez. This district contains the western third of the state as well as parts of southern Colorado, containing the cities of Grand Junction and Pueblo, the San Luis Valley, and the northeast portion of the Four Corners. Scott Tipton has yet to raise any significant challenger in the 2016 congressional election. Colorado's 4th congressional district is represented by Republican Ken Buck of Windsor. This district contains the eastern third of the state, as well as most of Douglas County along the I-25 corridor, the city of Longmont in Boulder County, and all of Weld County. Together, these compose 75% of the district's population. Ken Buck has yet to raise any significant challenger in the 2016 congressional election. Colorado's 5th congressional district is represented by Republican Doug Lamborn of north Colorado Springs. The district contains Chaffee, Teller, and Fremont counties in their entirety, and most of Park county. The district is anchored in El Paso County, containing 6/7ths of its population. The district is home to major military installations at Fort Carson, Schriever Air Force Base, Peterson Air Force Base, Cheyenne Mountain Complex and the United States Air Force Academy. Doug Lamborn has yet to raise any significant challenger in the 2016 congressional election. Colorado's 7th congressional district is represented by Democrat Ed Perlmutter of Golden. This district contains the northwestern portion of the Denver Metropolitan Area, including Lakewood, Golden, Arvada and Westminster in Jefferson County and Thornton, Northgate, and Commerce City in Adams County. Ed Perlmutter has yet to raise any significant challenger in the 2016 congressional election. Section 1. Vestment of political power. All political power is vested in and derived from the people; all government, of right, originates from the people, is founded upon their will only, and is instituted solely for the good of the whole. Section 2. People may alter or abolish form of government − proviso. The people of this state have the sole and exclusive right of governing themselves, as a free, sovereign and independent state; and to alter and abolish their constitution and form of government whenever they may deem it necessary to their safety and happiness, provided, such change be not repugnant to the constitution of the United States. ... the people reserve to themselves the power to propose laws and amendments to the constitution and to enact or reject the same at the polls independent of the general assembly and also reserve power at their own option to approve or reject at the polls any act or item, section, or part of any act of the general assembly. Initiatives and referred laws are considered by the electorate at every general election in Colorado. Many are housekeeping measures or lack substantial public support, but matters of great public concern are also considered such as the Taxpayer Bill of Rights (TABOR), enacted in 1992, which amended Article X of the Colorado Constitution to the effect that any tax increase resulting in the increase of governmental revenues at a rate faster than the combined rate of population increase and inflation as measured by either the cost of living index at the state level, or growth in property values at the local level, would be subjected to a popular vote in a referendum. Issues to be considered in 2010 include proposition 101 which would repeal unpopular increases in car registration fees as well as phone and, possibly, income taxes. Amendment 60 would cut property taxes and Amendment 61 would prohibit state and limit local borrowing. Many Colorado officeholders oppose these measures which they fear have substantial public support. Democrats are strongest in the City of Denver, Boulder County, Fort Collins, Pueblo, parts of the I-70 corridor and the San Luis Valley. The most Democratic counties in the 2012 presidential election were Costilla County in the south which contains San Luis, the oldest town in Colorado, San Miguel County on the western Slope, and Denver County. Republicans are strongest in El Paso County, the state's most populous county and home of Colorado Springs, and Douglas County, an exurb of Denver and one of the wealthiest counties in the country. Many Republican votes also come from the western slope near Grand Junction, the high mountain communities in the center of the state, and in the eastern plains. The most Republican counties in the 2012 presidential election were Washington, Cheyenne, and Kiowa in the eastern plains, and Rio Blanco County on the western slope. Denver's suburban counties usually hold the balance of power in Colorado politics. Adams, Arapahoe, Jefferson and Larimer are considered "swing" counties, despite voting for Democrats in the last two gubernatorial and presidential elections. These regional differences experienced a boiling point in 2013, when several of Colorado's northwestern counties put forth ballot measures designed to initiate secession from the state following the passage of several laws by the state legislature, including expanded background checks for gun purchases, magazine capacity limits on firearms, and a new quota on renewable energy production. The ballot measure was successful in Washington, Yuma, Phillips, Kit Carson, and Cheyenne County with a combined population of around 30,000, but was unsuccessful in Logan, Elbert, Lincoln, Sedgwick, Moffat, and Weld County, which alone was more than twice as populous as all other voting counties combined. This act of secession, which would have created a 51st state, would have required approval by the state legislature, the governor, as well as congress and the President. 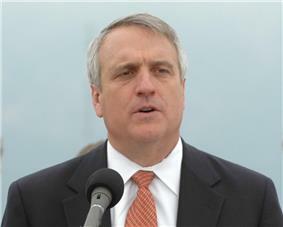 ^ Colorado Governor Bill Ritter appointed Michael Bennet to serve the remaining two years of United States Senator Ken Salazar term of office which was left vacant on 2009-01-20, when new United States President Barack Obama appointed the Colorado Senator to serve as his Secretary of the Interior.